Note: The final checkout page will not reflect your bonus. 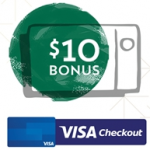 However, assuming you order before the supplies run out, you will see the bonus on your receipt and your eGift card will be delivered via email with the additional $5 bonus. Unfortunately, there is no way to know before you order whether the supplies have been exhausted, but the last time a similar deal came around, it lasted for quite some time. For terms and conditions of this offer, see this link.